One of my favorite ways to get a boost on Instagram is to join a loop giveaway. 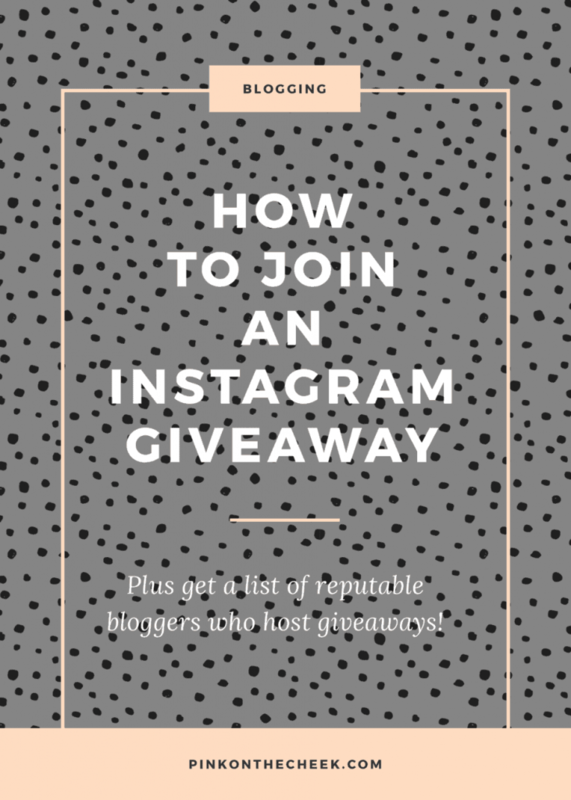 Today I am going to share my tips on how to join an Instagram giveaway! Loop giveaways are a hot topic right now and some bloggers swear by them by sharing a mix of personal content and giveaways. There are minor “risks” involved by attracting the wrong audience who are just following you for free items or will unfollow after the giveaway has ended. Why join an Instagram giveaway? When you join a giveaway with other bloggers and shops, you will get a boost of new followers from the participants who enter the giveaway. Yes, this is good for getting more followers, but I think this is a great way to increase your exposure! Just think, if you share something incredible on your Instagram, your followers might share your picture with their followers. If you follow a blogger who has joined a giveaway and posts, check to see if the giveaway picture caption mentions the host. Another option if the giveaway caption doesn’t mention the host, message and ask! I hate to even say this, but there are a lot of fake giveaways out there. Some hosts will scam participants into joining a giveaway where there will be no winner. Make sure you feel comfortable with the host and participants if you decide to join a loop giveaway. You should ALWAYS be able to contact the host to make sure the winner received their prize. Either through photos, receipts, or contacting the winner. Want a full list of bloggers who host reputable giveaways? Find this list in my resource library! Great post! I debated for the longest time about joining a giveaway, but after joining my first one, I was happy with the lift in followers and likes I got! I’m still sticking to some low-budget giveaways because I’m not willing to invest a ton of money into them yet. I’m curious as to which giveaways/loop hosts you have felt gave you the best return for the spend! I loved working with Lynn G.’s giveaways. She is really organized and the prizes are always fantastic! But…..How do we find Lynn G’s giveaways??? I made a list of reputable giveaway loops to join in my resource library! The sign-up link is in the post. I wasn’t able to locate the list of the giveaway loops. You would get the list on my free resource library. You just need to sign up using the link in post. I would feel really bad if someone joined a fake giveaway! Thanks for pinning!! This is so interesting… I had not thought before of joining a giveaway like this. I have won a few giveaways before, and it’s always exciting! I have been thinking about buying into some of those giveaways, but I don’t know if it is worth the hassle. I think in a strategic method, joining 1-2 a month is a great way to increase your reach on Instagram. This is so helpful! I have been thinking about participating in a loop giveaway and with your tips I am going to now!